We are happy to announce the first KO-OP album. "KO-OP 1" highlights the talent of two of our favourite new producers from Sevilla, Spain and Stuttgart, Germany. 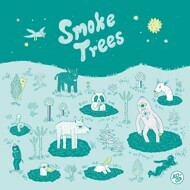 Juan RIOS' dreamy, sun-drenched grooves make a perfect fit with the slightly darker, jazz-induced sound of Smoke Trees. Juan RIOS and Smoke Trees represent the new wave of European beatmakers and reach 200.000 monthly listeners on Spotify. The album artwork has been designed by Berlin-based illustrator Rahel Süsskind (best known for her work with Money $ex Records) and comes with two (!) front covers.